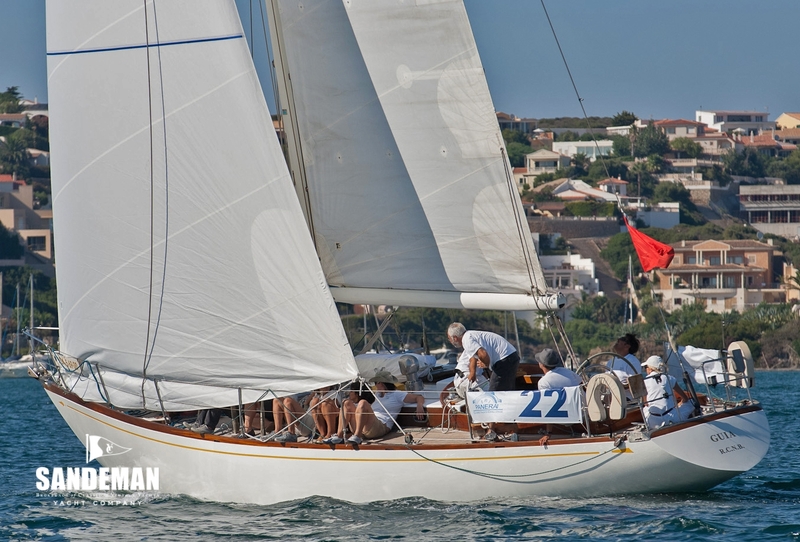 GUIA was built in Trieste in 1970 by Cantiere Mariano Craglietto to a Sparkman & Stephens design number 1909 - the same as that of MABELLE, a very successful Italian boat - but with lighter construction for a well known Italian sailor. 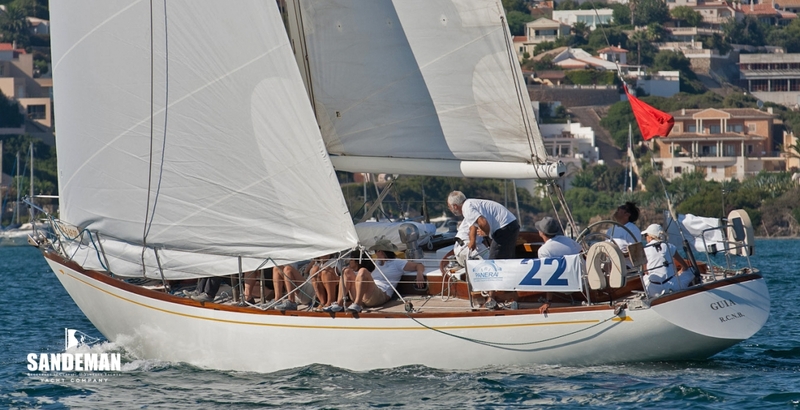 It was certainly a different era when a yacht this beautiful raced round the World in the first Whitbread Race. 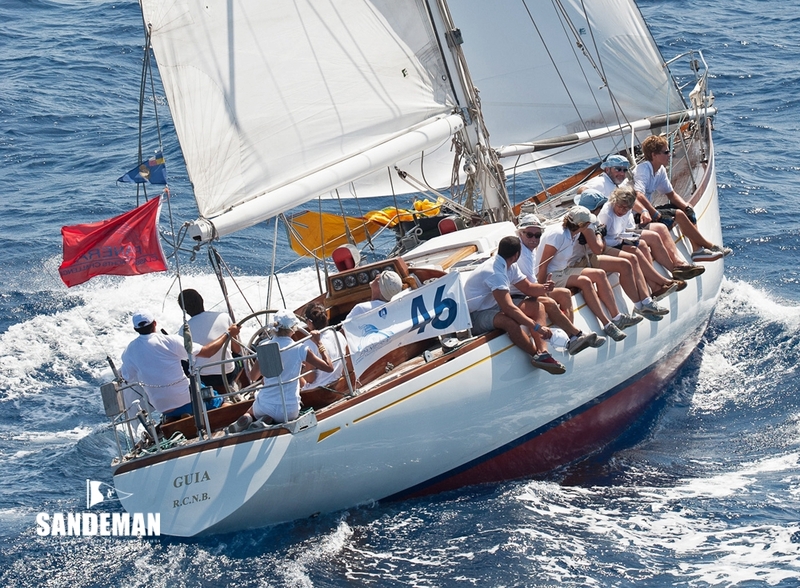 S&S seemed able to blend the CCA and the then blossoming IOR Rules into capable and fast boats with good looks as a by product. 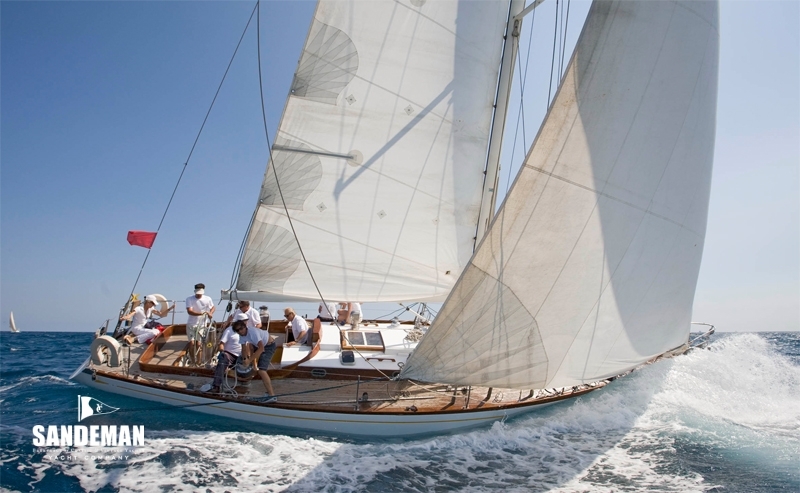 Testament to her fine pedigree, GUIA is a wonderful family cruising boat and races successfully on the Mediterranean Classic Circuit. 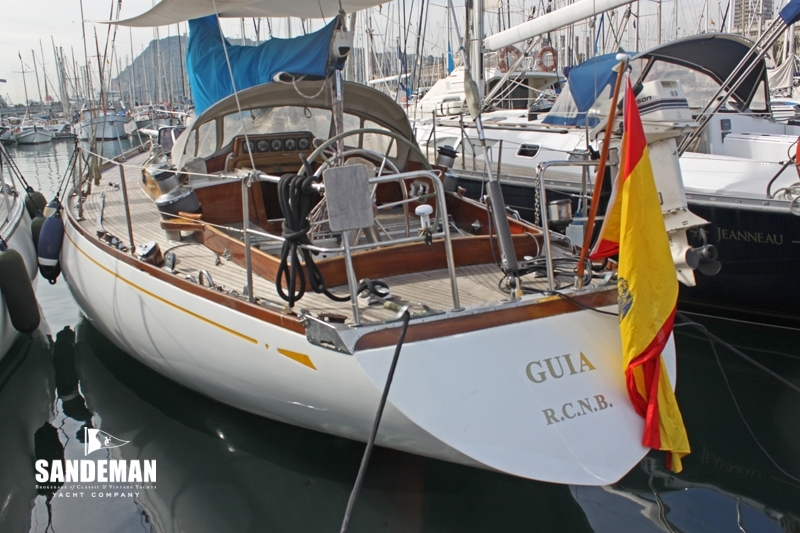 GUIA participated in the first Whitbread Round the World Race in 1973 finishing 5th individually – and the Italians winning as a team. 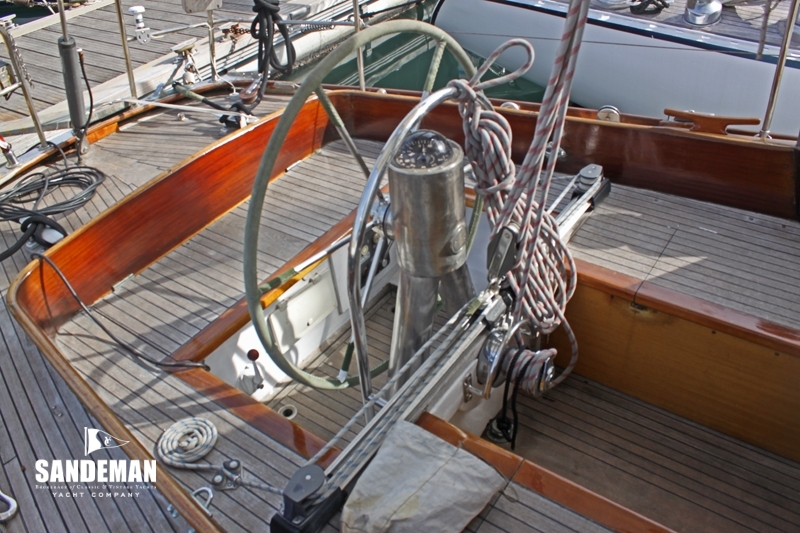 Trophies from this, the Cape Town to Rio race of 1971 and others are kept in and belong to the boat. 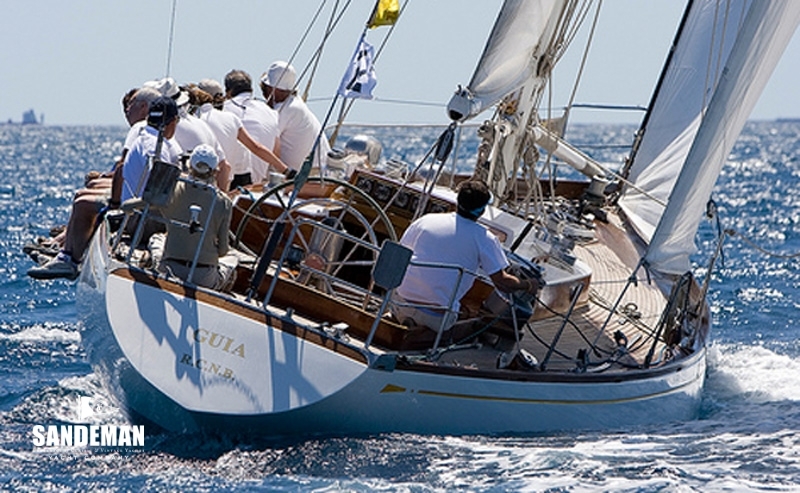 Under the current ownership from 1998, GUIA has been a family cruising boat in the Mediterranean - also taking part in some of the regattas in the Panerai classic yachts circuit. 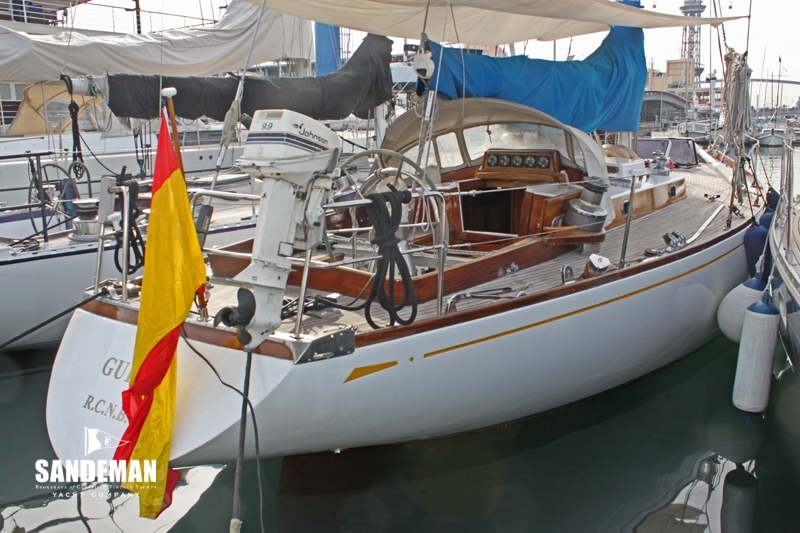 In 2017 and 2018 she won her class at Puig Vela Clássica, Barcelona. 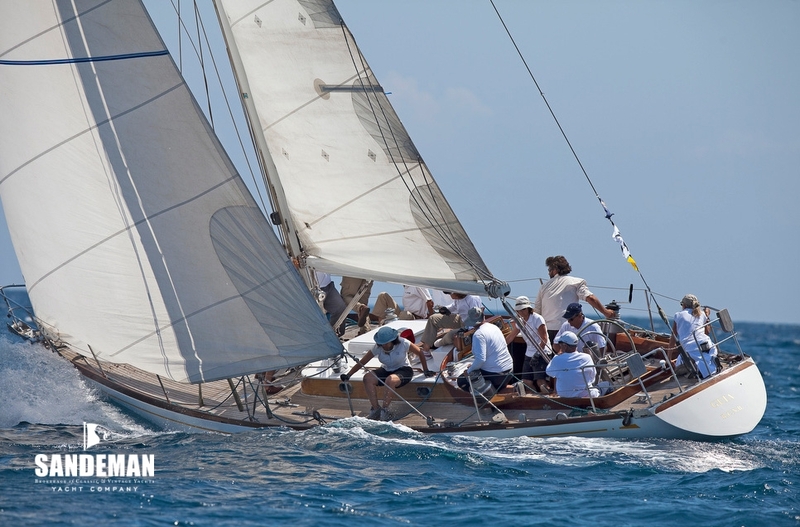 And she took second place in XIV Copa del Rey – Panerai Vela Clásica Menorca, 2017. 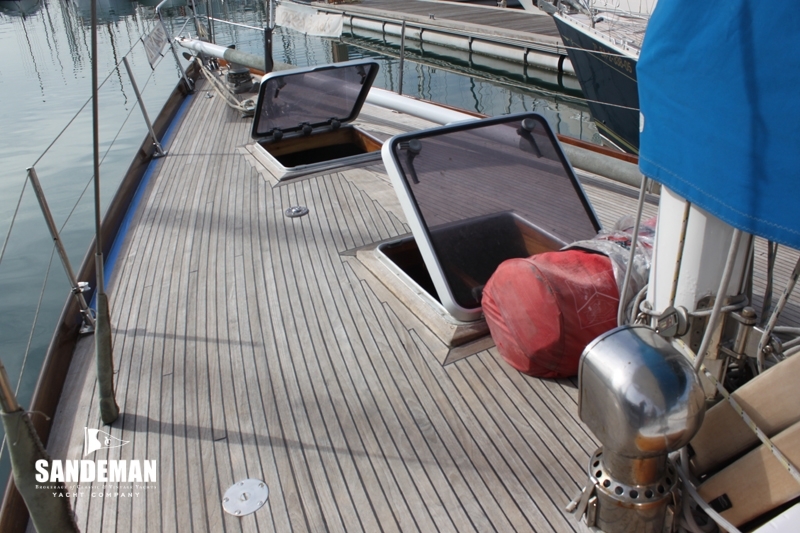 Access below can be either from the cockpit to the owner’s cabin aft or through the coach roof hatch directly into the saloon. 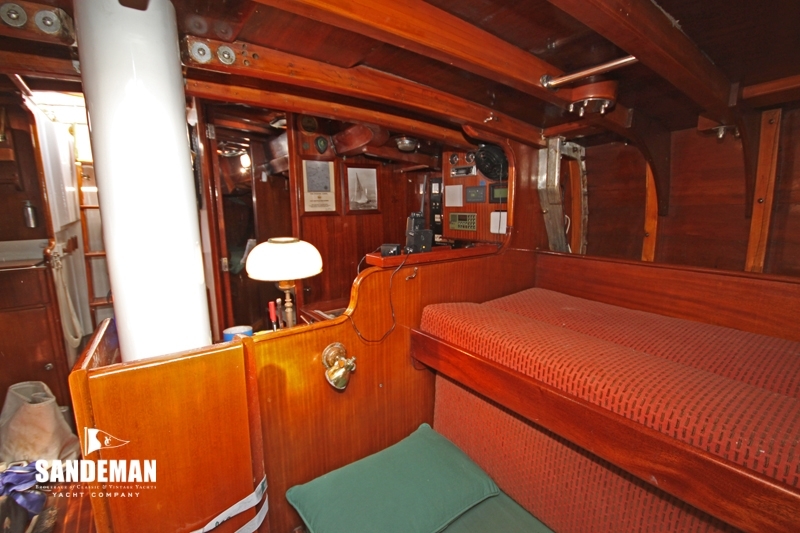 The beams, deck head, bulkheads and furniture are of varnished mahogany, the cabin sole of varnished holly and teak, overall combining elegance, ambience, and warmth with practicality. 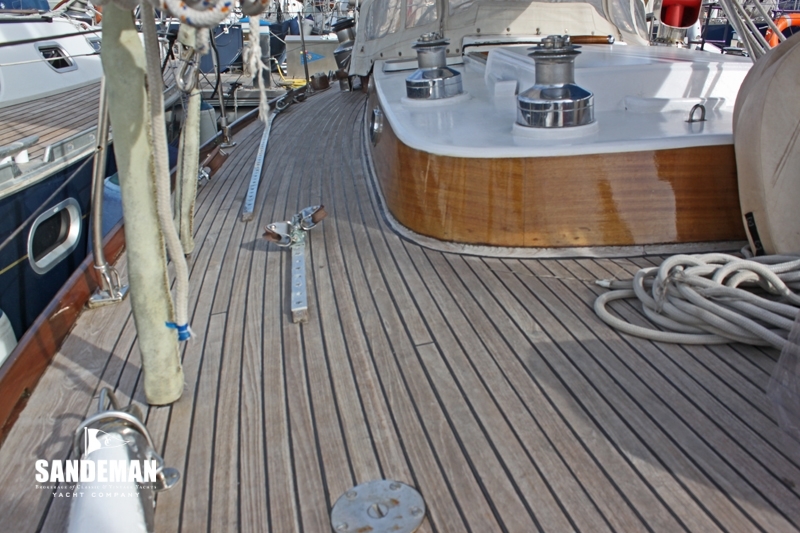 The elegant mottled coral upholstery items, renewed a year ago are also protected by removable green covers. 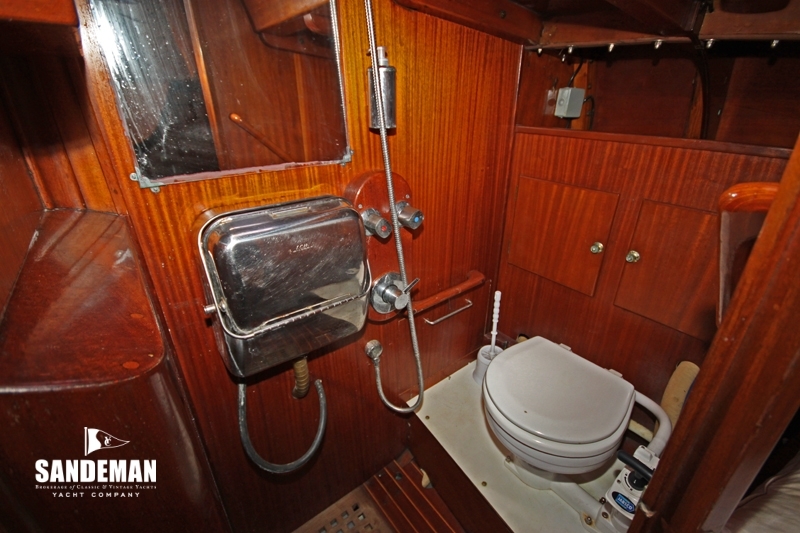 From the cockpit via a sliding hatch and steps down you enter in the owner’s cabin with a single berth each side and an en suite head compartment with folding basin, Blake WC and shower forward to starboard. 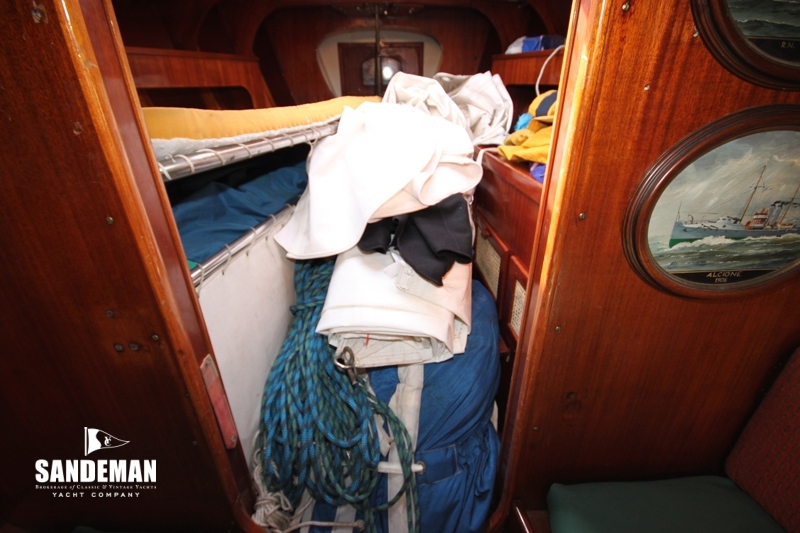 A hanging locker is forward to port and stowage is in drawers below and spaces outboard the berths. 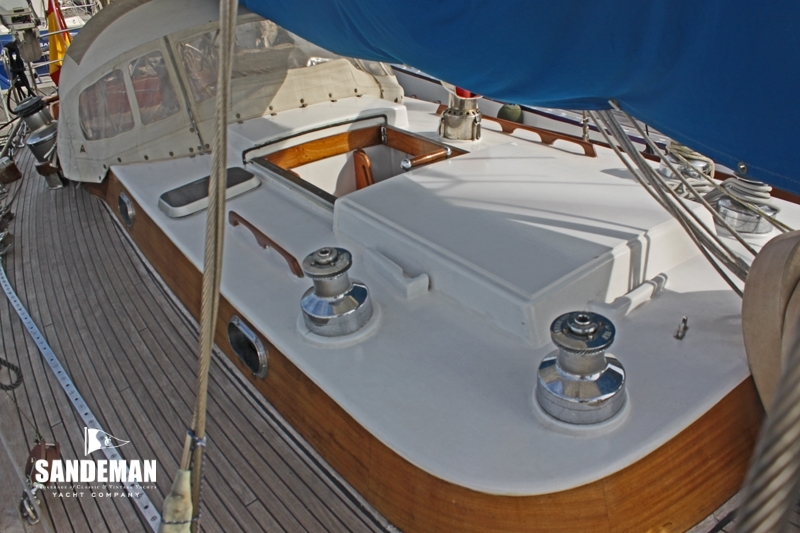 Two opening ports provide good ventilation. 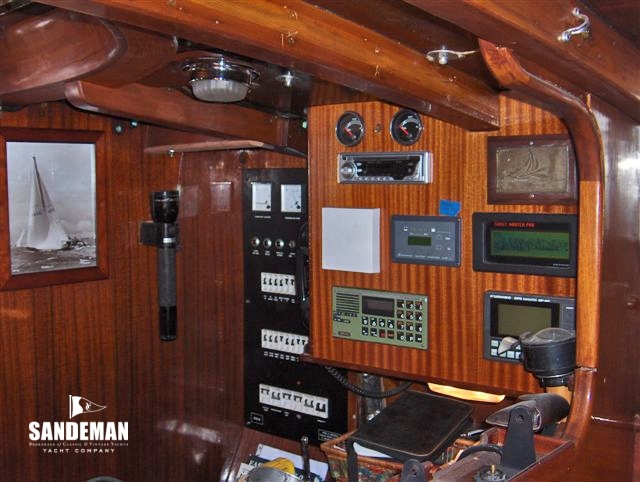 Moving forward past the main head (also with Blake WC and accessible to both cabins) you access the main cabin with a chart table and navigation area to port and a large galley starboard. 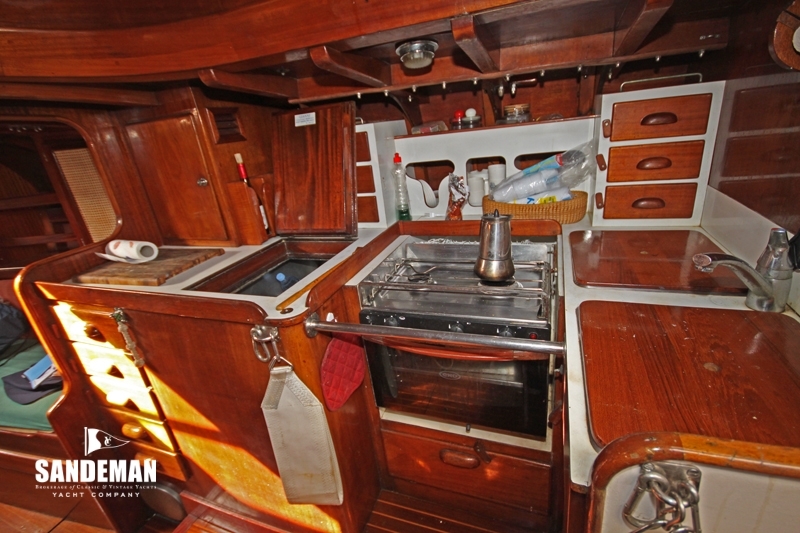 The galley has a double sink, 2 burner hob with oven and a huge and very well insulated stainless steel fridge. 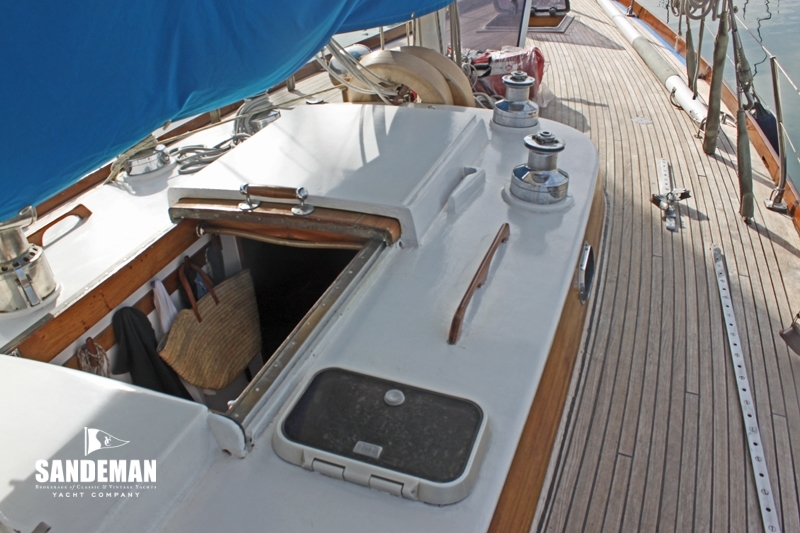 Access to this area can also be through the main sliding hatch over the coach roof and companionway steps down. 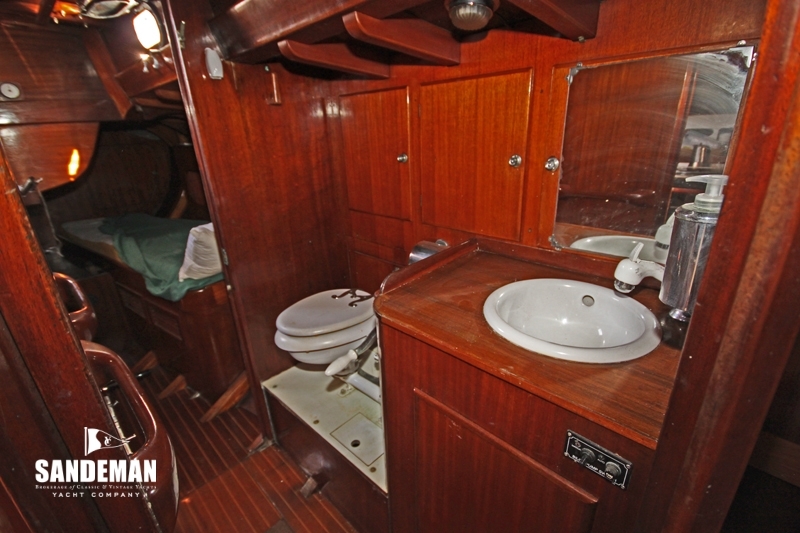 Forward and a further step down is the saloon with settee berths either side and another single berth above and outboard to port. 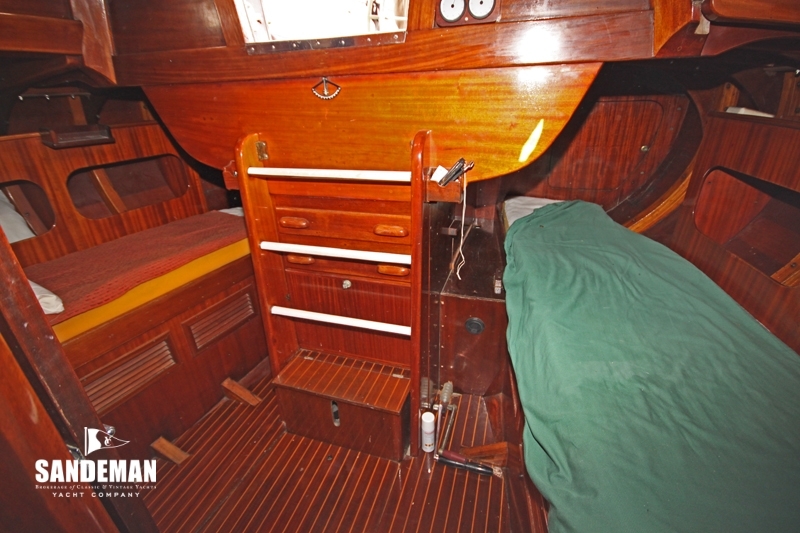 To starboard are two lockers with a book shelf between. 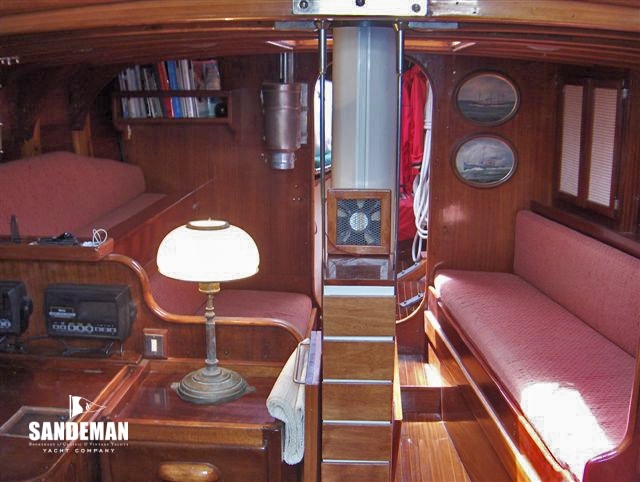 Amidships is a mahogany drop leaf dining table. 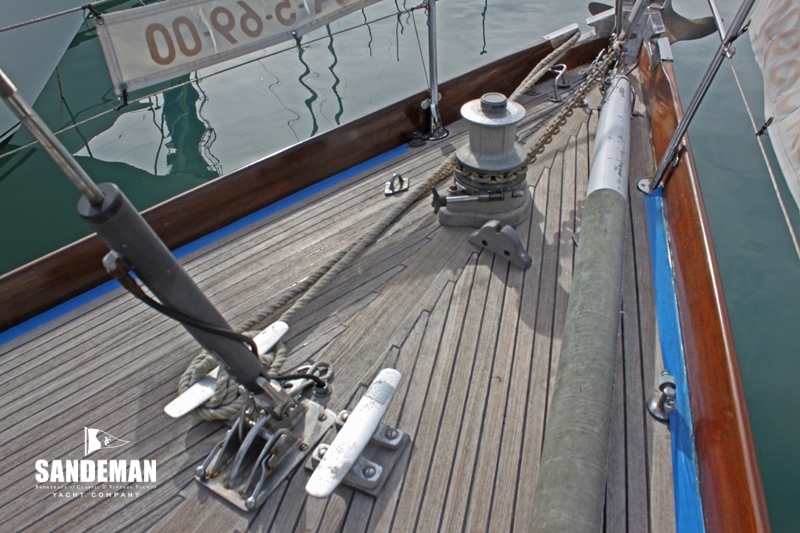 The forepeak had two lifting pipe cot berths with stowage below and outboard. 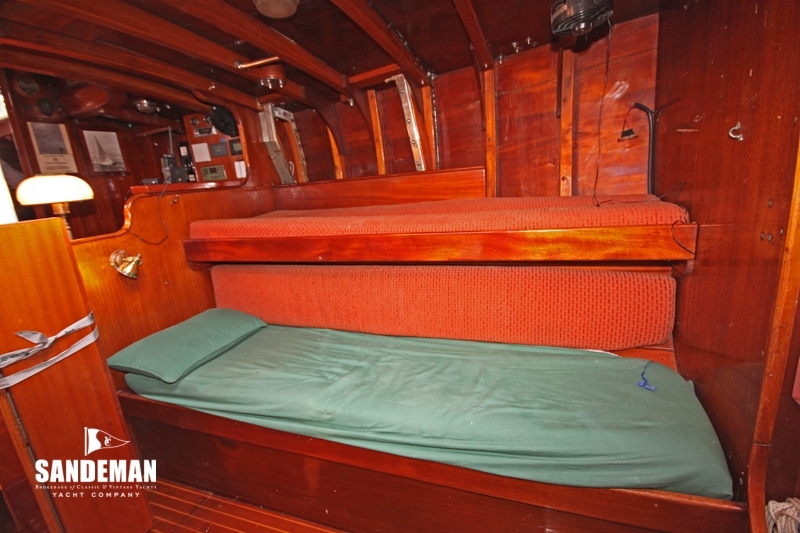 The starboard pipe cot, while available has been removed and lockers and drawers built in. 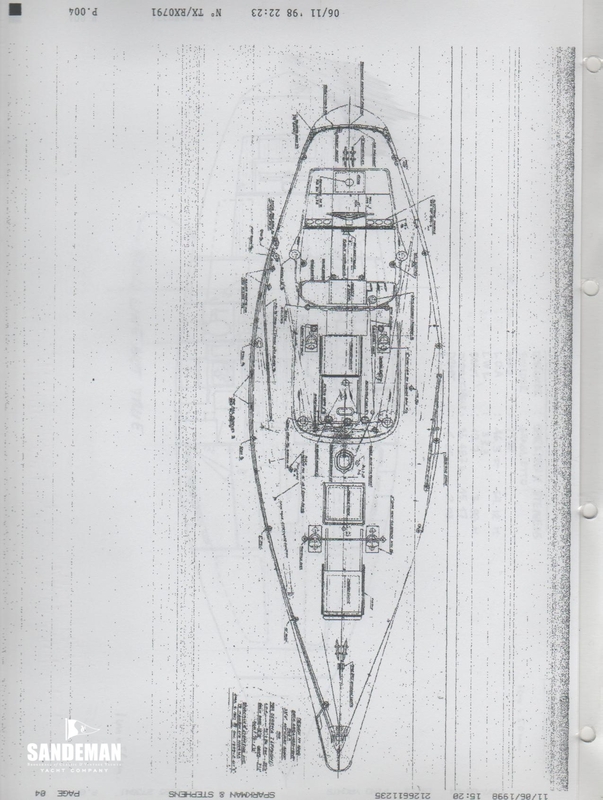 The foc’sle contains the very substantial chain locker. 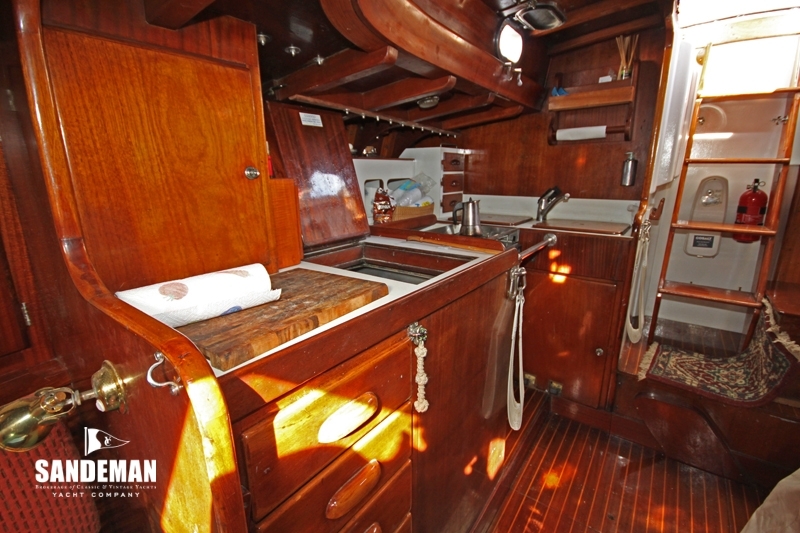 Ventilation is by hatches and opening ports by the galley, chart table and heads. 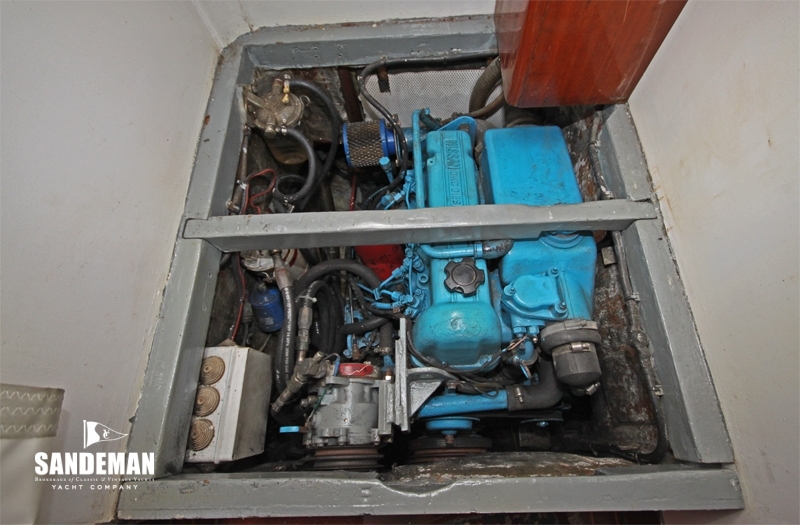 - New diesel Webasto air heating recently installed. 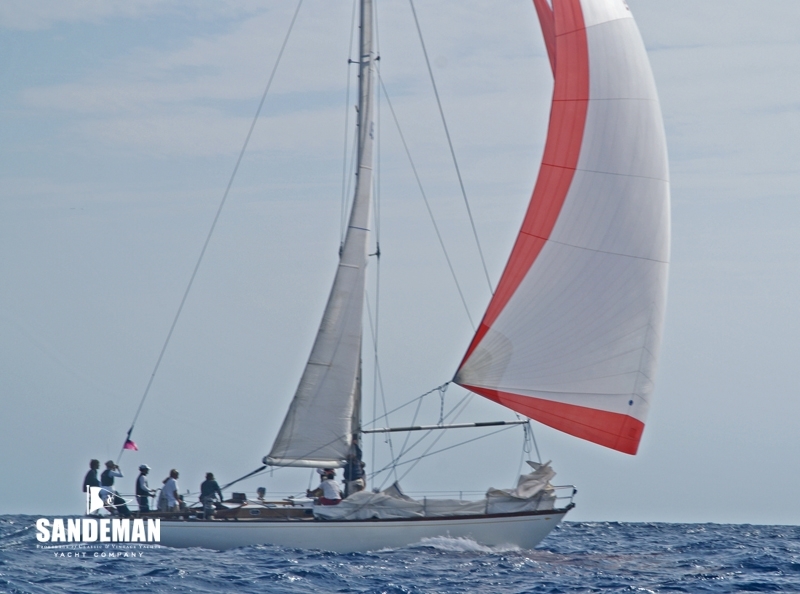 - 2 x Head stays; one for racing (hanks) and one cruising with Reckman reefing. 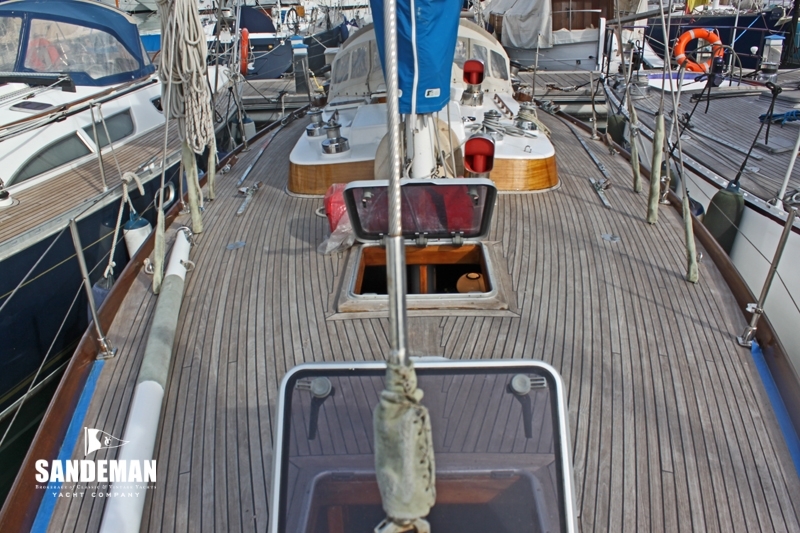 - Boom lengthened 40 cm. 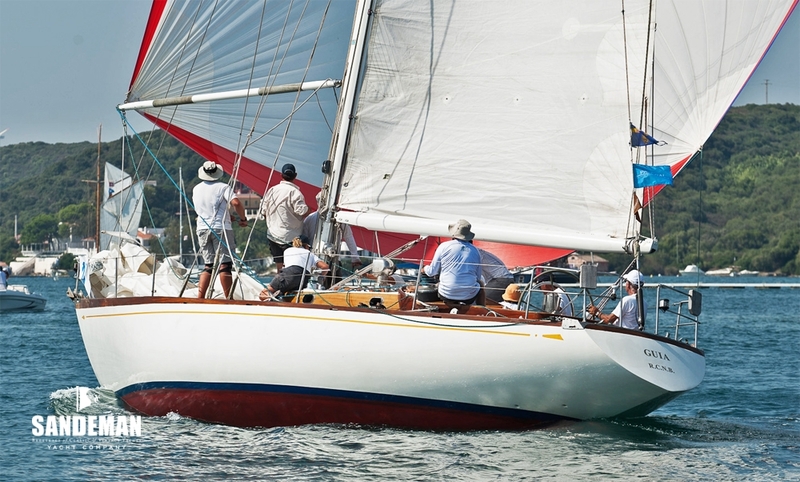 - B&G Analogue depth sounder, wind, speed. 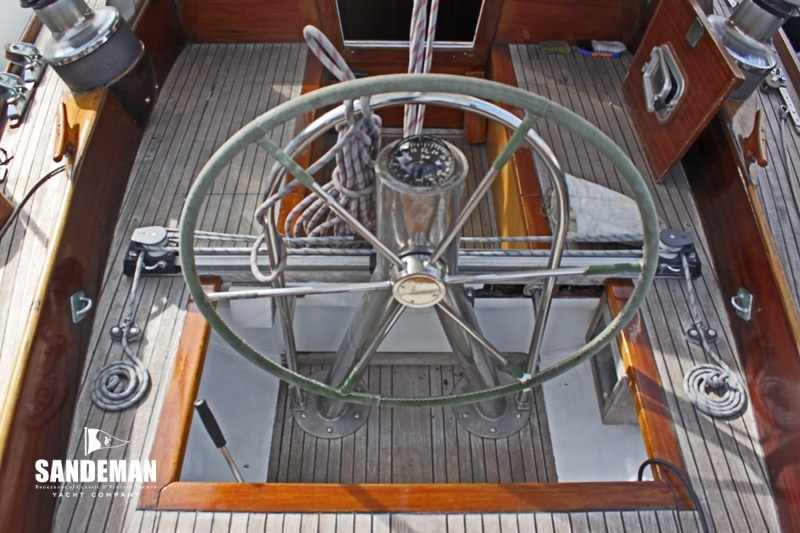 Under current ownership refit works include the following – some of these refer to equipment already itemised in appropriate sections above.